It's fair to say, I am not the most organised of people. I try, honest I do, but I always seem to be five steps behind. This year, though, I have been determined to get the garden sorted and keep it that way. It took me six weeks this summer to plant a border to match the one on the other side and that just left my nemisis; the back of our garden. It resembles marshland for most of the year, as it collects a lot of rain water and gets barely any sun, so it is hard to get anything to grow. Except bindweed. That stuff grows like, well, a weed. I had let it get quite overgrown, because I just couldn't deal with it all, it was everywhere. It was really bothering me, though, because it let the rest of the garden down and wasn't very nice to look at. Thankfully, though, my daughter, who is awesome, had an industrious afternoon recently and cleared all the weeds and dug it over, as a surprise. All I had to do was find something to plant. At this stage, I really wish we had a 'before' pic for you, but sadly not, so you will have to imagine it's jungly chaos. #bloggerfail I do struggle to keep up with it, because of my back problems, so we have worked hard to make it as low maintenance as possible. 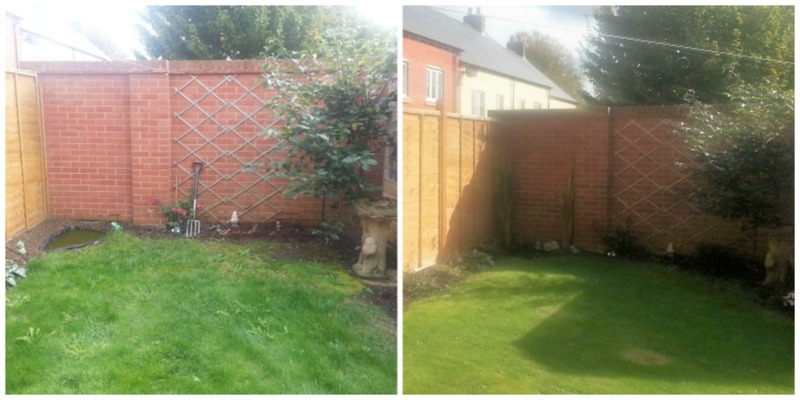 Click the link to read about our previous attempts at Effort-Proofing the Garden. This is the before picture, after it was cleared, along with the finished result. It took so long, the sun was going down by the time we finished, so the photo isn't very good. It still isn't perfect, we have work to do to get the grass looking healthy again, particularly under the apple tree, but it's neat and tidy and I really like it. The difficult bit, though, is keeping it this way! My stepmum, who is a landscape gardener, and wrote quite a lot of this very post, sent me some bulbs to plant that love shade and I'm really looking forward to seeing those bloom in the spring. 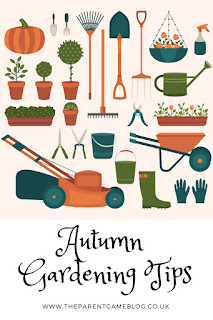 Waltons have produced a really useful Autumn gardening advent calendar, which is brilliant for people like me, who struggle to stay on task and get distracted by shiny things and small animals. 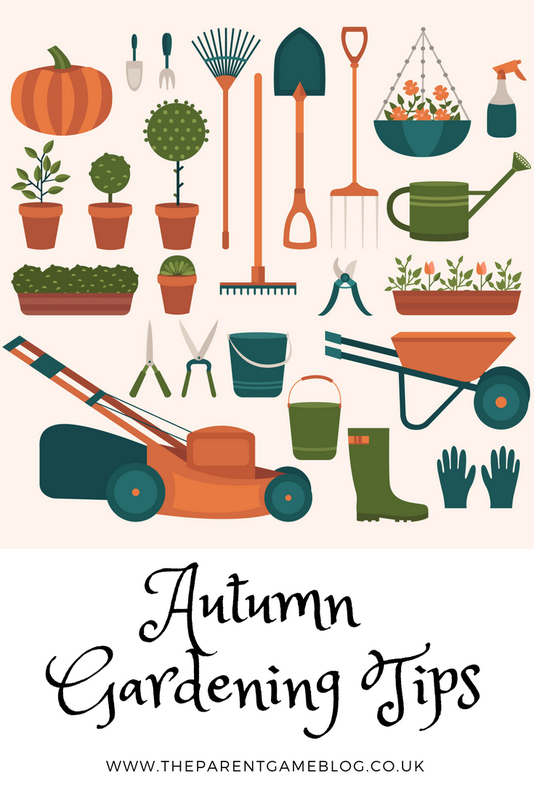 You can click on each day, and it gives you a task to do, that will keep your garden in tip top shape over the Autumn months and prepare it for winter. Below are my (stepmum's!) 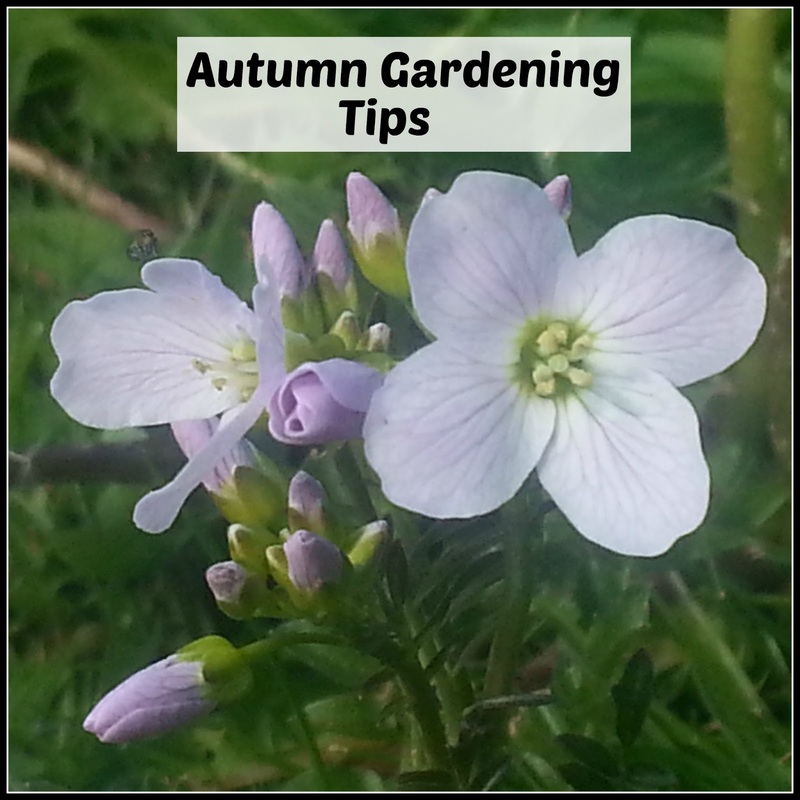 top tips for Autumn gardening. Leaves cause damage to lawns if left to rot over winter so rake them all up and get composting! Leaf mold can be made from most types of leaf (although some take longer to break down than others). All you need is a standard plastic refuse sack. Fill it with fallen leaves, pierce holes in the bottom and leave ('scuse the pun) for a year. Then you will have lovely, natural soil conditioning compost for free! Who knew pesky leaves could be so useful? This is a great time to scarify (rake) and aerate (poke holes in) your lawn. Scarifying rids the lawn of all the bits of rubbish and moss that collects over the summer and aerating allows the ensuing rain to penetrate deep into the roots. You can buy aerating tools, even shoes, but you can also use a garden fork, just stab it into the soil at regular intervals, to encourage lush green growth over the winter. 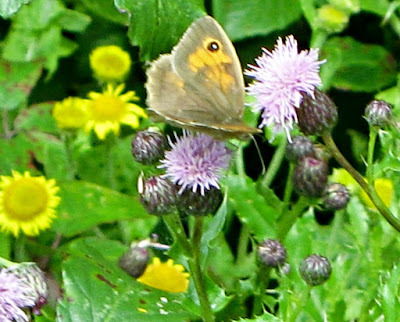 You can also use this time to feed and seed over any bare patches. This is the time of year to deal with your perrennials, now that they have started to die back. Some people prefer to cut their perrennials back quite vigourously, leaving not much more than a stump. Whilst this will not damage the plant, we are big fans of feeding the birds, and they do love a good seedhead, so consider leaving any big juicy heads for the wildlife. Similarly, the stalks of thick, woody perrenials are often hollow and offer homes to the local bug population. Encouraging bugs also encourages bigger wildlife to your garden, such as birds and hedgehogs. Pruning is important to encourage new growth in the spring. If a plant or tree is spending its energy decaying and rotting down old stalks, it can't spend it on the new growth it needs to flourish. Prune deciduous (leaf shedding) trees. The evergreens can be left until Spring. Lightly pruning shrubs, such as bush roses, will offer protection against high winds. Buddleia can also be cut back by half, to avoid wind damage. Divide water lilies or pond plants that have got too big and cut back any edging plants where the foliage has started to dip into the water. Falling leaves are a big problem in autumn and it helps to use leaf netting during this time of year when the most leaves fall. Any leaves that do make it into the pond should be removed, as they add to the ammonia level in the water and can cause stagnation. It's also a good idea to remove the pump and store it safely in preparation for the winter frosts. Once all these little jobs are done, it's time to sit back and enjoy the quieter winter months and have a good rest from weeding and mowing until the spring! Brilliant tips, you obviously know your gardening! We have just planted some bulbs for spring, but I still need to get out and do some major shrub pruning, been putting it off as it is hard work! Well done you for facing the job at hand - looks great for it! I really enjoyed reading this. I have enjoyed gardening again this year after being in a flat without a garden for eight years.